We’re well into the thunderstorm season on Long Beach Island and already a few doozies have moved through the area. Overall, thunderstorm action has been quiet but there have been a few instances of severe thunderstorms that the National Weather Service defined with wind gusts exceeding 58mph and/or hail 1-inch or greater in diameter for any particular thunderstorm cell. 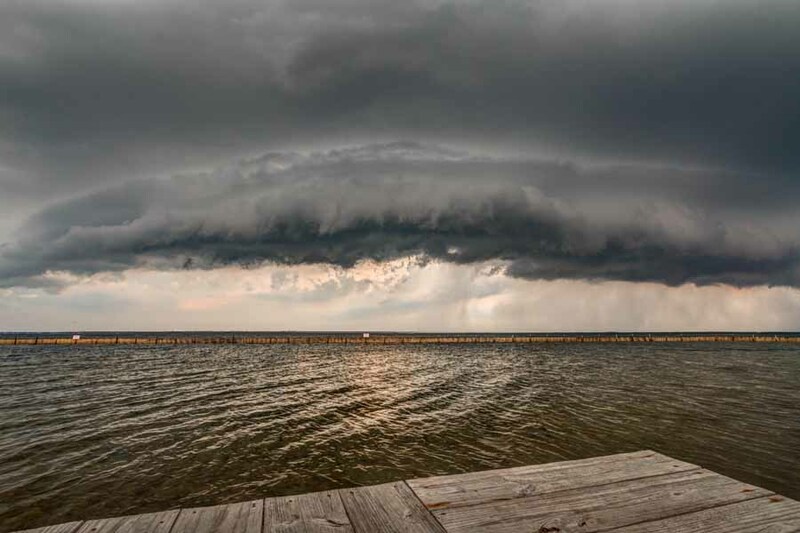 This photo was taken from the Surf City bay park of a severe-warned thunderstorm. Green is the part of the color spectrum with the strongest wavelengths of color. Therefore, the green spectrum has the best chance to penetrate cumulonimbus clouds and gives us that green color when observing an approaching storm. the bay in a surreal nature. This thunderstorm triggered severe warnings for wind and hail. Barnegat Light saw golf ball-size hail and Surf City saw a wind gust of 63mph from this shelf cloud. I plan to collect more thunderstorm photography as I chase severe weather events that threaten coastal New Jersey. Be safe!